This so-called “dockless technology” has become wildly popular in China, and it’s rapidly spreading to cities like Boston. The problem, as noted by Boston Bike Attorney Andrew Fischer, is that it may ultimately hinder Hubway’s growth model – which may be bad for cyclists in the long-term. Normally, competition is a good thing, as it gives consumers more choices. However, Hubway (operated by Motivate) has the exclusive rights to operate a bike system in Boston, Brookline, Cambridge and Somerville – at least until 2022. Hubway is also seeking expansion into several other Boston suburbs. The goal was to seek gradual expansion into these other communities, beginning in Downtown Boston and continue into the adjoining neighborhoods. However, the presence of these independent, dockless technology bike share companies has the potential to thwart Hubway’s continued growth and success. 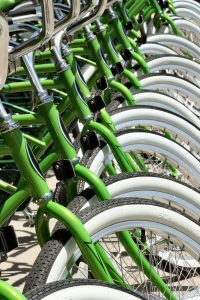 The private companies, like Ogo, which recently released hundreds of rent-able bicycles in Chealsea, Worcester, Rever and Malden, have the advantage of limited capital investment. They don’t have to invest in a docking station. They don’t have to invest in bicycle lanes. These “rebel model” bike share companies, including LimeBike, another competitor seeking a launch in Malden, aren’t required to make these capital investments because their system only requires the bicycles and the apps. The bicycles come with their own locking mechanism and can be dropped off anywhere. Riders use smartphone technology to find and unlock a bike nearby. When the user is finished with the bike, he or she can dock it anywhere it’s legally allowed. The bike locks by keeping the rear wheel secure. The next user will receive a code via the app that will allow them to unlock it. They pay $1 an hour for the service. Overall, dockless systems generally cost less to run. Absent the docking station, there is no infrastructure that has to be installed. That means these companies can push forward with faster expansion. But that’s not necessarily what’s best for Boston cyclists hoping for a safer, more comprehensive bicycling system. While it’s true that the more bicycles on the road, the more accustomed drivers become and thus the safer we are, we can’t overlook the importance of the infrastructure investment. This same kind of dockless system technology wouldn’t necessarily take off in a larger metropolitan area like New York or Los Angeles because these areas are so large, geographically and population-wise. But in Boston, this competition could have a huge impact on future growth of city-backed bike-friendly offerings. It hasn’t so far, Fischer noted, but it merits a watchful eye. Hubway has a variety of plans from which users can choose, including a $99 annual subscription that gives users the first half-hour free and charges $3 an hour after that. Those who aren’t members can pay $8 for a full day pass. The city’s Metropolitan Area Planning Council (the local agency behind Hubway’s launch) recently solicited bids from a number of firms seeking to implement a dockless system in more than a dozen communities, including Quincy, Arlington and Newton. A representative of the city’s transportation department told the Globe that Motivate is eventually going to incorporate it’s own dockless system. The promise of competition in nearby cities could mean that happens sooner rather than later. In addition to the city’s investment in bicycle infrastructure with programs like Hubway, another benefit of city-owned and operated bikes, according to city leaders, is accountability. Still, businesses hoping to jump into the fray insist the city’s current rate of expansion with Hubway is inadequate, and their services could help fill in the gaps in service. It should be noted that there doesn’t appear to be any prohibition against taking a dockless bike from one of these vendors, riding it into Boston and leaving it there for another customer. It’s not yet clear whether Hubway intends to take action against this infringement on its territory. The city does not allow riders to lock bicycles to trash barrels, benches or trees. However, some of these vendors don’t require the bikes to be locked to anything. Some have expressed concerns that these private company bikes have become something of a nuisance, with some social media users posting photographs of rented dockless bikes that have fallen into the sidewalk. Theft is also a possible problem (or at least it has been in China), but companies here say their bikes are tracked with GPS systems that help prevent such occurrences. The private companies say they aren’t trying to step on toes, but they don’t have the ability to post an employee at every possible entrance into the city and demand users turn back or leave the bike at the border. Our Boston bike injury lawyers understand why these companies have seized on the opportunity, but it remains to be seen what impact they may have on the city’s investment in cycling and bike infrastructure.